Many of you are familiar with the Blowout Cards website and forum. It was a year and a half ago that wunderkindcards (a.k.a. BeaverSportsCards) started a thread in the Blowout Cards forum titled “Checkoutmycards.com”. This has since become the most popular thread the Blowout Cards forum has ever seen. There are more than 3,500 posts on this one thread. Many of the Blowout Card members have become Check Out My Cards members, and at the National last year in Chicago a number of these common members made sure we got a chance to meet a few of the folks from Blowout Cards and to start thinking about potential partnership opportunities. It as been a very busy year for both of our sites, and this year at the National we finally got a chance to discuss making those ideas a reality. I am glad to announce that last week we officially signed a partnership agreement, and we are now starting to implement some updates to our sites and service offerings that will illustrate how the whole can be greater than the sum of its parts. Blowout Cards specializes in selling factory sealed boxes and cases. Check Out My Cards specializes in making it safe & easy for people to buy & sell singles. Both sites try to be industry leaders through innovation. 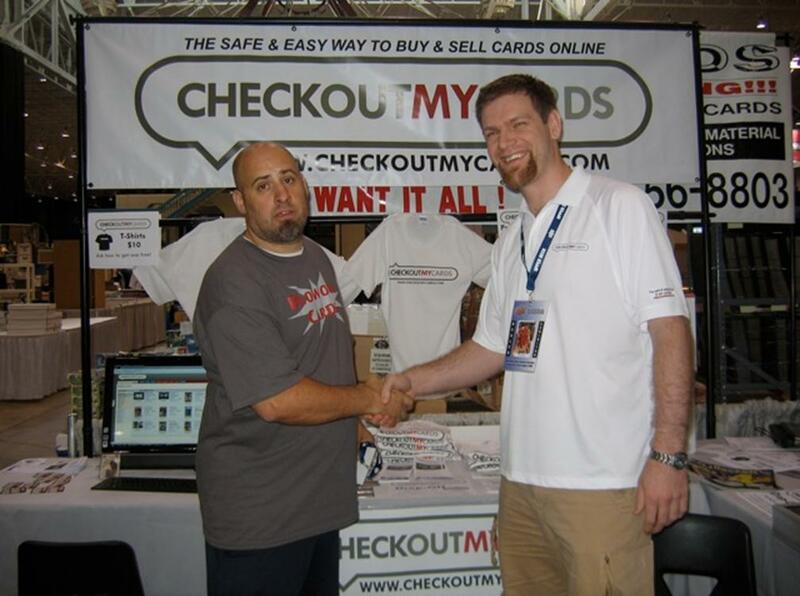 – Blowout Cards was the first seller of boxes & cases to start a highly successful forum. Check Out My Cards has reaped the benefits of this forum. – Blowout Cards and Check Out My Cards have stared using services such as Twitter, Facebook, YouTube, and blogs to reach the community. – Check Out My Cards set out to create a consignment service that could be cost effective for any cards that might sell for $1 or more. Many people have even found it to be successful for cards that sell for well under $1. – Check Out My Cards has scanned more cards than any other sports card website. More than 1,000,000 cards have been scanned using patent-pending technology. Now you can use the store credit that you earn from selling cards on COMC.com to buy Blowout Cards gift certificates. You can than buy factory sealed boxes & cases from Blowout Cards, crack them open, keep the cards you want, and send us the rest to earn more funds to buy more product. Of course, you can also use your store credit on Check Out My Cards to buy other singles or to get cash. This just the beginning. We will continue to find more innovative ways that we can leverage each others services. This entry was posted in new features and tagged BlowoutCards. Bookmark the permalink. WOW! Just when I think COMC can’t get any better than it already is, you guys blow it up! What a great idea, I know I’ll be getting some Gift Certificates for Blowout Cards. You guys are making it alot easier to stay away from e-bay now. Keep up the great work. Thanks for all that you guys do. Great work! Congratulations on the partnership. Together you will create so much more. Congradulations. Best of Luck to you both. That is great news! I am a big fan of both companies.